Chalet Broski comfortably sleeps 14 guests across 6 cosy bedrooms, some with en-suites and all with beautiful contemporary furnishings. The large living area is open plan and light with large windows and spacious balconies to take advantage of the fantastic views along the Belleville valley. The balconies also provide the perfect area for an après-ski beer and some night star-gazing. The log burning fire is the perfect focal point for some evening entertainment, book reading, game playing or stories of the days events on the mountain, or if you fancy watching a movie then why not settle into your very own cinema, with hundreds of the latest movies to choose from. The ground floor is home to your very own library, with a huge collection of books and DVD's to choose from. The sauna and spa bath are also located on the ground floor and are a perfect way to cleanse your body and relax those tired muscles. Our large boot-room provides a safe and secure spot to leave all your ski & snowboard equipment, and we also have an industrial-grade boot drier to ensure your boots are fresh and dry when you slip into them first thing in the morning. Just outside the front door is where you will find our brand new 7 person Jacuzzi! What better way to relax those aching ski muscles and soak up the mountain atmosphere from our lantern lit private terrace. Chalet Broski is situated in a quiet corner of the world renowned Three Valleys ski domain, close enough to enjoy the apré ski vibe of the great towns and village in the Belleville valley and beyond, but far enough away to really soak up the alpine atmosphere and charm of the Haute Savoie. My wife Danielle and I have always had a desire to live in the mountains, a love of people and a passion for cooking. We started Snow Trippin because we see running our own chalet business as the perfect way to combine our passions. We work with many like-minded, dedicated and passionate individuals and companies within our industry that are continually pushing the boundaries, and that help us to continue to develop our skills and services. Chalet Broski is an eclectic mix of rustic farmhouse and contemporary living space, sitting atop a little hamlet just outside of St Martin de Belleville. The building was renovated and completed in 2008, using all of the old materials and re-purposing them to be used in the finish of the new chalet. This gives Chalet Broski a very different feel to any other chalet on the market. 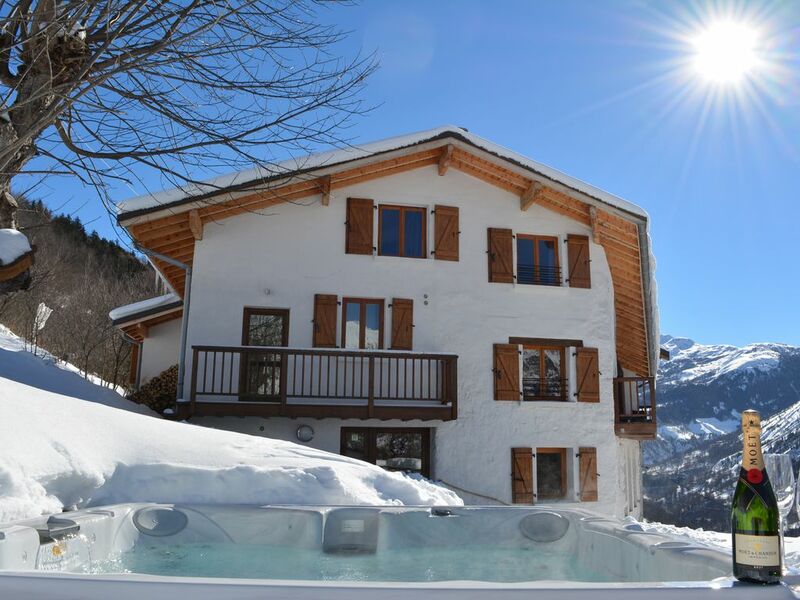 The location is also fantastic; close enough to the beautiful village of St Martin de Belleville to easily access the vast 3 Valleys ski area, but far enough away to feel like a real mountain retreat. Chalet Broski's star attractions are its fantastic views of the beautiful Belleville valley from our large balconies and exterior terrace, together with the huge open living spaces inside. The chalet sleeps 14 guests across 6 bedrooms, but even so it never feels cramped. We have a huge living room with enough seating for 14 people, a wonderfully cosy library with hundreds of books, a sauna, a cinema projector, an XBox games den, bar billiards table, oh and an 8-seat Jacuzzi outside on the terrace! Chalet Broski really is a fabulous space for families and groups of friends... a true mountain retreat. Staying here made this a truly unforgettable holiday. The chalet is a little out of town which actually suited us really well after a long days skiing. It is really modern, clean and well equipped with everything you could possibly want on holiday - sauna, hot tub, projector movie room, play station snug, spa bath, mini bar.... The quality of the chalet is absolutely brilliant, it literally can't be faulted at all. However, without a shadow of a doubt, the best thing about this was our excellent hosts Danielle and Paul. Between them they have this absolutely perfected and are such a lovely and accommodating couple, they make this work so well. The food is to die for - we went to quite a few restaurants while we were here and none cam close to the food at the chalet, that for us was such a treat! I can't recommend this more, we will certainly be going back for our next ski trip!